TRIUMPHANT city council leader Sir Albert Bore says he will wait with interest to see who Prime Minister David Cameron appoints as Local Government Secretary to see if he can get a fairer funding deal for Birmingham. The Labour leader was speaking after his group tightened their grip on Britain’s largest local authority taking two new seats from the Tories and Lib Dems to take the total to 79 out of 120. It was an unexpected success for Labour at a time when the party in on the ropes nationally following a disastrous general election. Many also thought that recent crises with the failing children’s services department, the Trojan Horse schools scandal, the cuts to the Library of Birmingham, the damning Kerslake review and green waste charges would harm the Labour group. Sir Albert, who was re-elected in the Ladywood seat he has held since 1980, said: “We have done well at a local level because we have been open and honest with the people about the problems we have faced. He said that he will work with the next set of local government ministers to put the case and negotiate for a better deal for Birmingham. And he will be holding the Government to promises made on devolution for Birmingham and working with neighbouring councils on a combined authority to promote closer working between Birmingham, Solihull and the Black Country councils. But before that Sir Albert faces a leadership challenge when the Labour group meets on Monday, which is set to come from Quinton councillor John Clancy who has previously stood for the leadership three time and lost. Both were successfully re-elected to the council. The Mail understands that Coun Clancy will tell his colleagues that a majority Tory government could look to make an example of Birmingham following the high profile failings of the last few years. He may suggest that a change of leadership from Sir Albert, who is preparing to enter the fourth year of his second spell in charge of the council, could buy Birmingham some more time. 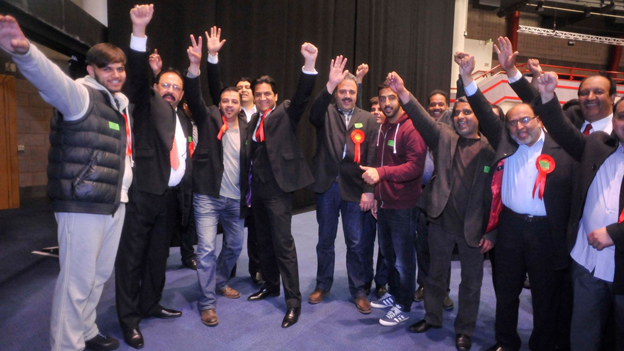 Another side affect of Labour’s strong showing was that all five cabinet members who were up for re-election retained their seats, giving Sir Albert a tough decision to make as he has a queue of up-and-coming councillors demanding a place at the top table. The Conservatives had high hopes having won two Labour seats in last year’s elections, but ended up losing one on the day in Weoley. The seat has been the most marginal at a council level, with the 2012 election won by the Conservatives by just two votes. 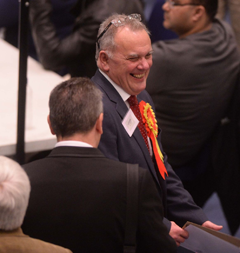 However Labour’s Steve Booton was elected at his fourth attempt. Conservative leader Robert Alden (Erdington) said that the parties must now put the election behind them and work together to turn around Birmingham City Council’s fortunes. Key results in Birmingham saw Stechford and Yardley North, where long standing Lib Dem councillor Barbara Jackson had stepped down, fall to Labour. There were also notable wins for Lib Dem leader Paul Tilsely in Sheldon, and former Tory cabinet members John Lines and Timothy Huxtable in Bartley Green and Bournville respectively. And two councillors, Matt Bennett (Cons, Edgbaston) and Des Hughes (Lab, Kingstanding) were returned to the chamber following a spell off the council.